Actually, I can’t explain everything, but Dobby can. That’s Dobby Winnick, aka Dobablob, aka The Prince. 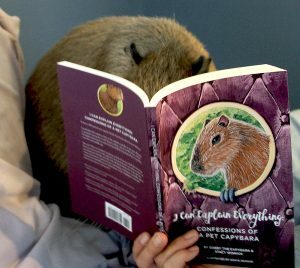 Luckily for the rest of us, Dobby has written the world’s first autobiography of a capybara: I Can Explain Everything: Confessions of a Pet Capybara.